2005–2006 Półroczny staż naukowy w Zakładzie Archeologii Egiptu i Nubii w Instytucie Archeologii Uniwersytetu Warszawskiego. 2006–2016 projekt dokumentacji dipinti budowlanych na terenie świątyń Hatszepsut i Totmesa III w Deir el-Bahari (Egipt), w roli wykonawcy projektu. 2007 Uzyskując dyplom magistra z wynikiem bardzo dobry uhonorowany DIPLOMA HONORIFICUM UW. 2007/2008, 2010/2011, 2011/2012, 2012/2013, 2013/2014, 2015/2016, 2017/2018, 2018/2019 Stypendysta Ministerstwa Nauki i Szkolnictwa Wyższego w Stacji Badawczej w Kairze, Centrum Archeologii Śródziemnomorskiej Uniwersytetu Warszawskiego. w druku Wieczorek D.F., Hieratic dipinti in the Hathor Shrine Sanctuary of the Thutmose III Temple Complex at Deir el-Bahari, w: N. Beaux, in cooperation with D.F. Wieczorek et alii, La Chapelle D’Hathor. Temple de Thoutmosis III à Deir el-Bahari (MIFAO), Caire. 2015 Wieczorek D.F., Building dipinti in the Hatshepsut and Thutmose III Temples at Deir el-Bahari: Summarising four seasons of work (2006, 2008, 2009, 2011), w: J. Budka, F. Kammerzell & S. Rzepka (eds. ), Non-textual marking systems in Ancient Egypt (and elsewhere), Lingua Aegyptia – Studia Monographica 16, Hamburg, 49–57. 2010 Wieczorek D.F., Building dipinti in the Temple of Hatshepsut at Deir el-Bahari, Preliminary observations 2006–2008”, w: M. Dolińska, H. Beinlich (red.) 8. Ägyptologische Tempeltagung: Interconnections between Temples. Königtum, Staat und Gesellschaft früher Hochkulturen. Wiesbaden, 213–220. 2009 Wieczorek D.F., Some remarks on dates in the building-dipinti discovered in the Temple of Hatshepsut at Deir el-Bahari, w: Popielska-Grzybowska J., Iwaszczuk J. (eds. ), Proceedings of the Fifth Central European Conference of Egyptologists. Egypt 2009: Perspectives of Research. Pułtusk 22–24 June 2009, Acta Archaologica Pultuskiensia 2, 207–211. 2019 Ejsmond W., Wieczorek A., Wieczorek D.F., Gebelein Archaeological Project 2018: Temple and fortress area on the Eastern Mountain, Polish Archaeology in the Mediterranean 27/1. 2018 Wieczorek D.F., The building dipinti documentation project in the Temples of Hatshepsut and Thutmose III at Deir el-Bahari. Documentation method, Göttinger Miszellen: Beiträge zur ägyptologischen Diskussion 254, 139–147. 2017 Ejsmond W., Chyla J.M., Witkowski P., Wieczorek D.F., Takacs D., Xu-Nan L., Oeters V., Kuronuma T. and Grylak A., Report on the archaeological survey at Gebelein in the 2014, 2015 and 2016 seasons, Polish Archaeology in the Mediterranean 26/1, 239–268. 2015 Wieczorek D.F., A rock inscription of Ramesses IV at Gebelein. 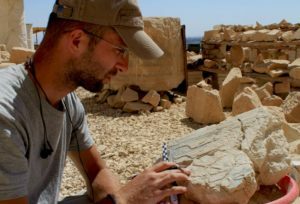 A previously unknown New Kingdom expedition, Études et Travaux 28, 217–229. 2015 Ejsmond W., Chyla M.J., Witkowski P., Wieczorek D.F., Comprehensive field survey at Gebelein: preliminary results of a new method in processing data for archaeological site analysis, Archaeologia Polona 53, 617–621. 2014 Wieczorek D.F., Preliminary documentation of building dipinti from the Temple of Tuthmosis III (2010/2011 season), Polish Archaeology in the Mediterranean 23, 199–206. 2011 Wieczorek D.F., Building dipinti in the Temple of Hatshepsut, Documentation work, season 2007/2008, Polish Archaeology in the Mediterranean 20, 203–211. 2009 Wieczorek D.F., Building dipinti from the Temple of Hatshepsut, Preliminary remarks, 2005/2006, Polish Archaeology in the Mediterranean 18, 285–289. w druku Wieczorek D.F., Ejsmond W., Witkowski P., Worship in stone – Newly discovered graffiti expressing personal piety at Gebelein, Egyptian Archaeology. w druku Wieczorek D.F., Hieratic inscriptions in the Thutmose III Hathor Shrine Sanctuary at Deir el-Bahari, The Luxor Times Magazine. 2018 Wieczorek D.F., Ejsmond W., Anbetungen in Stein – die ältesten Zeugnisse persönlicher Frömmigkeit, w: Antike Welt, Zeitschrift für Archäologie und Kulturgeschichte 4/18, 4. 2010 Praktyka dydaktyczna w Instytucie Archeologii UW w Warszawie w ramach Studium Doktoranckiego na Wydziale Historycznym UW.